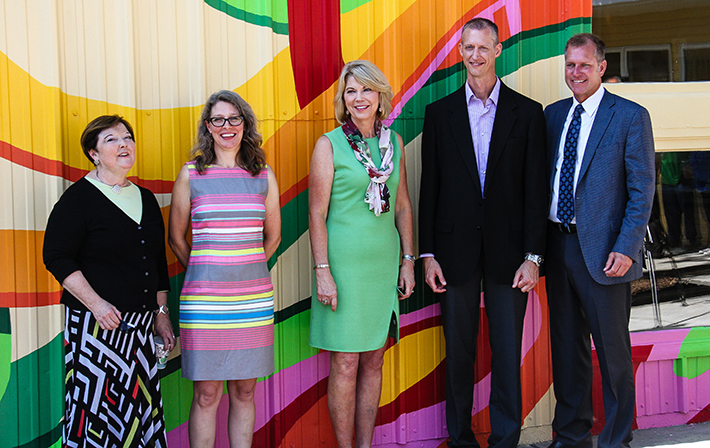 On Tuesday, August 11, 2015 the City of Omaha celebrated the renovations at Sherman Community Center and the UNO SummerWorks 2015 season and mural project with a press conference. The event featured representatives from the City of Omaha, Sherman Community Center and the University of Nebraska – Omaha, who spoke about the renovations and mural project. Speakers included Omaha Mayor Jean Stothert, Omaha Parks and Recreation Director Brook Bench, muralist Kristin Pluhacek and SummerWorks Director Kathe Oleson-Lyons. Schemmer architect’s Scott Heaney, AIA and Kevin Flecky, AIA, were also on hand for the press conference. The Sherman Community Center renovation project is just part of an expansive renovation project led by the City of Omaha. Schemmer provided architectural and electrical engineering services for the existing 6,000 SF community center, located at 5701 N. 16th Street. The project included a new roof, interior and exterior paint, new flooring and a new reception area. A new mural celebrating the importance of growth – both physically and emotionally - was publicly unveiled during the press conference. Throughout the summer, 150 teenagers from UNO’s SummerWorks Employment Academy, which annually provides jobs for at-risk-youth, assisted Pluhacek. The mural depicts a watering can providing support to a collection of multi-colored vines, which faces the building’s community garden. Since it opened in 1978, the Sherman Community Center serves North Omaha as a place where community members can meet and rent out space for events and special occasions. Click here to visit Schemmer's Sherman Community Center portfolio page and view renovation photos.